6th day of the Clean Teen Publishing post!! Sean pulled back the curtain and glanced outside the window for the hundredth time that day. Nothing obscured his view of the parking lot and the road beyond. Despite the densely parked cars in the parking lot, he saw no sign of the blonde haired fire wielders who had attacked him and Jessica. The strangers seemed to have gone as they came. He let go of the curtain and let it fall back into place. Though it seemed as though the Fire Warriors hadn’t followed him to his apartment, Sean refused to let go of the nervous breath he was holding. After all the time that had passed since the fire in the park near Xander’s house, no one had heard from his best friend. On the few rare occasions in which Sean ventured out from his apartment, he had asked some of Xander’s former classmates if they had seen him, which none had. He hadn’t been to the school nor returned to his parent’s home. His friend had, for all intents and purposed, vanished. Pushing himself off the couch, Sean walked toward the kitchen. His refrigerator was running dangerously low of food but there was always food to make into a decent snack. He knew the jokes Xander would make about eating as a nervous habit but Sean felt justified in being nervous. As he opened the refrigerator and started pulling out lunchmeat, he heard a gentle knock on the door. He froze, his hand unmoving around the plastic turkey container. “Go away,” he whispered into the room. He didn’t know who was at the door but he honestly didn’t care. He doubted Xander would knock so gingerly and no one else would be bringing him good news. Sean slid the turkey package out of the refrigerator as quietly as possible and softly closed the door. Logically, he knew that the person on the other side of the door couldn’t hear his refrigerator closing. Normal people couldn’t hear that, he had to remind himself. His best friend could control the wind. The people that were hunting him could throw fire from their hands. There was no telling if super hearing was another of their hidden super powers. As he reached toward the stack of bread, the same person knocked again at the door. Glancing around nervously, his eyes fell on the bottle opener magnet hanging from the fridge. Sean pulled it off the fridge and held it in front of him defensively. He left the kitchen and walked toward the door. When the person knocked for the third time, it seemed far more insistent. “Who’s there?” Sean asked, trying to force some mock confidence into his voice. Sean visibly sagged with disappointment. He almost wished it were one of the Fire Warriors. Sean sighed as he reached out and unlocked the door. As he pulled the door open, he was surprised to see a fairly disheveled Jessica standing before him. Loose tendrils from her shoddy ponytail hung over her face. She didn’t seem to be wearing any makeup, aside from the obvious lip gloss that caused the unnatural shine on her lips. She wore a loose-fitting blouse that was heavily wrinkled. Sean couldn’t remember ever seeing her looking anything less than fully composed. Despite her obviously harried expression, she still found the reserve to frown at her nemesis. She opened her mouth to offer a sharp retort but quickly thought better. “I didn’t know where else to go,” she admitted sheepishly. “Not by a long shot,” he replied. “Can I please come in now?” Something in her voice caught Sean off guard and the humor seemed to bleed out of the situation. He nodded and stepped out of the way. As she entered the apartment, he closed and locked the door behind her. She walked a few steps inside before turning toward him. Glancing down, she noticed the bottle opener in his hand. Sean was genuinely dumbfounded by the question, especially since he didn’t have a logical answer. He tossed the bottle opener onto the couch angrily. “And you came here?” Sean yelled before throwing a hand over his mouth to silence himself. “You came here?” he said again in a harsh whisper. The words faded from her lips as someone knocked on the door. The stern knock was the complete antithesis to Jessica’s soft knocking from earlier. Jessica started to whimper but Sean stepped forward and clamped his hand down over her mouth. Sean slipped past her and eased his way to the door. Leaning forward, he glanced out the peephole. The man on the other side of the door was unmistakable. His close-cropped blonde hair and dark leather tunic looked identical to the man that tried to kill Sean at Xander’s house. “Is it?” Jessica asked, leaving the end of question hanging. Sean nodded as he inched his way back to her. The Fire Warrior banged loudly again on the door. Sean disappeared into the kitchen as Jessica moved to the door. Sean leaned around the corner and nodded. She held up three fingers and silently counted down. When she dropped the last finger, she unlocked the door and threw it open. The Fire Warrior on the other side seemed temporarily startled. He quickly overcame his surprise and stepped into the room, chasing after the retreating Jessica. She stumbled backward and fell into the middle of the room. The tears already threatened to fall down her face as she stared at the frightening warrior entering the room. The Fire Warrior smiled wickedly and extended his hand. The tips of his fingers ignited as flames danced over his hand. “Here I am,” he replied, stepping through the kitchen door. He held up the large red cylinder in his hands and pointed the nozzle at the confused Fire Warrior. Sean squeezed the handle to the fire extinguisher and the far end of the room was consumed in white powder. The cloud sprayed over the Fire Warrior, extinguishing the flames on his hand, as he was covered head to toe in white foam. Sean held down the handle until the small extinguisher ran dry and sputtered in his hand. As the cloud settled, the entire room was coated in white foam, to include an undignified Jessica who sat sputtering on the floor. The Fire Warrior coughed loudly as he seemed frozen in confusion. Sean paused, realizing that he hadn’t thought through his plan beyond spraying the man with the extinguisher. Despite him being coated in inflammable foam, Sean was still facing a vastly physically superior man. “I really didn’t think this through,” he muttered as the Fire Warrior reclaimed his wits and stormed toward Sean. Sean gulped and dropped the extinguisher, as though releasing the weapon would alleviate him of the blame. The warrior reached Sean in a few large strides and grabbed him by his shirt. Despite Sean’s weight, the Fire Warrior lifted him from his feet and pinned him against the wall. “Can’t we talk about this?” Sean said meekly. The blonde warrior merely growled at him. The Fire Warrior leaned in, his nose mere inches away from Sean’s face. Sean could practically see the fire burning behind his dark eyes. A hollow thud suddenly echoed through the room. The smoldering glare in the warrior’s eyes disappeared as his eyes rolled up into his head. The Fire Warrior pitched to the side, his arms going limp and releasing Sean in the process. Jessica stood behind the warrior, clinging to the extinguisher like a club. She looked nervously at the unconscious Fire Warrior. “You think he’s going to be okay?” she asked. “Who cares,” Sean replied, laughing nervously. Jessica dropped the extinguisher and smiled weakly. Sean returned the smile before spreading his arms and motioning her forward. “You did great,” he said as they hugged one another in relief. For a long moment, they stood straddling the unconscious blonde man, embraced in each other’s arms. Suddenly, as though remembering her surroundings, Jessica stiffened. “Sure,” he said softly as he took in the smell of her hair cascading past his face. “This moment’s over,” she said sternly, pushing him back. As they separated, Sean inadvertently kicked the unconscious Fire Warrior. The man groaned softly. The pair looked at each other again, suddenly remembering what brought them together in the first place. “What are we going to do about him?” she asked. Jon Messenger (Born 1979 in London, England) serves as an United States Army Captain in the Medical Service Corps. Since graduating from the University of Southern California in 2002, writing Science Fiction has remained his passion, a passion that has continued through two deployments to Iraq, a humanitarian relief mission to Haiti, and an upcoming deployment to Afghanistan. Jon wrote the "Brink of Distinction" trilogy, of which "Burden of Sisyphus" is the first book, while serving a 16-month deployment in Baghdad, Iraq. 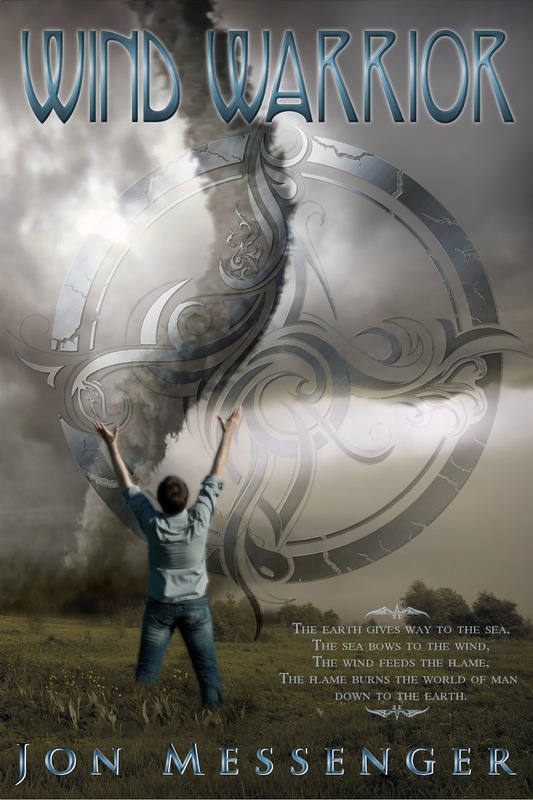 Wind Warrior is Jon Messenger's break through novel published through Clean Teen Publishing. I'm thrilled about the direction this book is heading! I hope you all enjoy the fun back and forth between Sean and Jessica... there's plenty more of that in book one and throughout the next few books to come! Have you drawn a winner for this giveaway yet? My computer hasn't shown one yet. I'm excited to find out! I didn't do the giveaway, the publisher did, so I'm not sure. I will contact them and see!